A planet exerts a small gravitational pull on its parent star, causing the star to wobble. The motion amplitude depends on the orbital distance and mass of the planet. 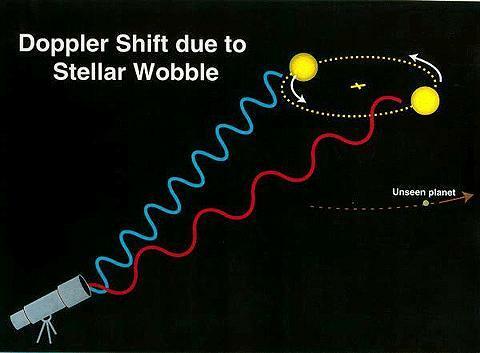 The star motion is detectable with the Doppler Effect. The light coming from a star moving toward the Earth will be Doppler shifted to bluer (shorter) wavelengths, while a star receding from the Earth will emit light shifted to redder (longer) wavelengths. The effect is very small. For instance Jupiter induces a 12 m/s velocity change on the Sun for an extern observer whereas the Saturn effect is only 2.7 m/s. A periodic Doppler shift of the star light reveales the presence of the planet as long as you have the precision to see the variations. We reach now precisions of 8 m/s with Elodie and < 5 m/s with Coralie on short timescales.